I warned you that there would be more coming to this blog besides just writing about writing about writing…and so on. I’m going to start blogging about other things in my life, like travels we go merrily on and food we eat and other things that I promise won’t be as boring as they sound. As you may or may not know (how dare you not know everything about me), I’ve had to eat totally gluten-free for about a year and a half now. Something happened to my insides when I had my gallbladder removed, which I realize sounds super scientific. But the fact is, after saying bye to that organ, I said hello to rashes, allergies, hives, stomach pain, and lots more every time I ate anything with wheat in it. So after some pretty intense experimenting (which involved me clinging tearfully to donuts yelling YOU CAN’T HAVE THEM), I’ve figured out what works for me. And gluten does not. It’s not that big of a deal except for the high cost of certain gluten-free foods, but one of the only problems I still deal with is dessert. It’s really, really, REALLY hard to find a cookie or donut or cupcake that tastes the same without gluten. But believe me, I try. 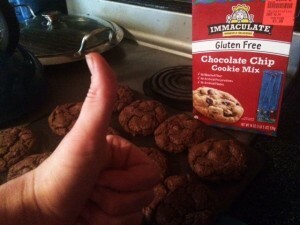 This particular adventure in *drum roll* Gluten-Free Baking! 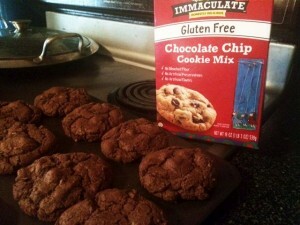 involves a chocolate-chip cookie mix from Immaculate (Honestly Delicious). That’s not my commentary, per se, it’s written on the box. Anyway, the week before this particular adventure, I had tried Immaculate’s sugar cookie mix and the result was nothing less than little pellets of chalk. I’m quite serious. You couldn’t take a bite without little chalky tidits attacking your chin and mouth and shirt and the floor. It was a disaster. 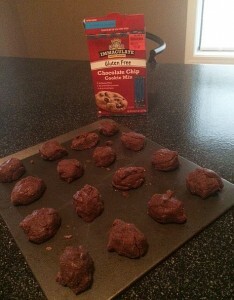 Never to be deterred for long, I decided to try the company’s other mix I found, the chocolate-chip cookie mix. As in, regular cookie dough with little chips of chocolate scattered throughout. Right? As someone that does NOT specialize in cooking or baking in any way, I would not blame you if you instantly assumed it was operator error. But I can assure you, shockingly enough, that I did nothing wrong. I’ve made cookies dozens of times in my life, and the directions were extremely simple, and I can’t take the blame for these cookies being 100% chocolate and 0% chip. 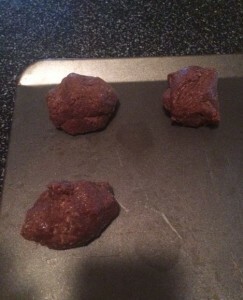 However, I’m a complete optimist, so I said sure, why not, let’s bake these suckers and maybe something mind-blowingly awesome will happen when the heat hits them and they’ll come out in perfect little cookie/chip ratios. Ahem, cough, where are the chips, cough cough. Or not. But you know what, they tasted great. 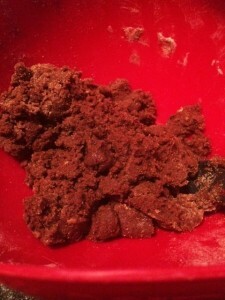 And super chocolatey. Like, if these had been billed and sold as double-chocolate or double-fudge cookies as they should have been, I would have been ecstatic. 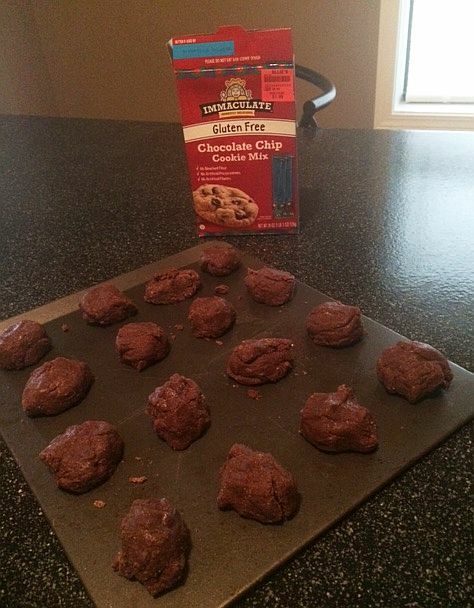 Because as chocolate cookies, they killed the game. So no, they weren’t chocolate chip (or even close, like does this company know what chocolate chip is supposed to be even? ), but guess what, I ate the dang things and they satisfied my chocolate craving, so I still give them much higher marks than the company’s sugar cookie mix. Hahaha! 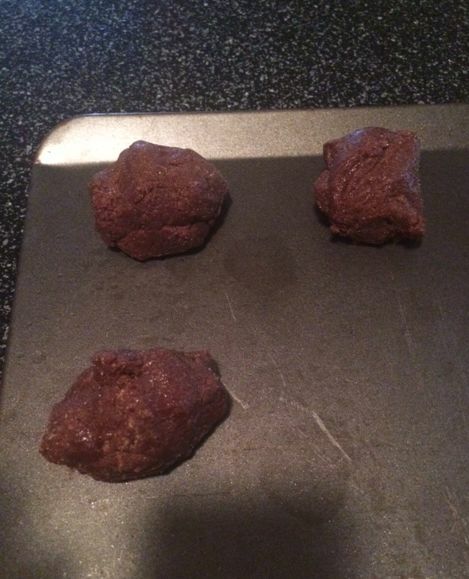 That’s too funny – they’re obviously chocolate cookies, and look delicious even. Looks like someone put the wrong package in the wrong box. Wow! Completely agree haha…label it as chocolate cookies and I’m sure you’ll still sell a ton AND be accurate. Lmao.